Washington State University chemical engineering student Kristian Gubsch is the school’s first recipient of the prestigious Ernest F. Hollings Undergraduate Scholarship, administered by the National Oceanic and Atmospheric Administration (NOAA). The nationally competitive award pays $19,000 total for the Edgewood, Wash., student’s 2018-19 and 2019-20 academic years, provides a 10-week paid summer internship at an NOAA facility, and funds travel to present at two scientific conferences. “It’s a huge honor to win the Hollings, one I didn’t expect,” said Gubsch. “It’s a compliment to my accomplishments and the hard work I’ve put in. The other winners were impressive. He has been on a trajectory to become an engineer for years. As a high-school student, he enjoyed math and science, spent time at the University of Wyoming’s Engineering Summer Program, and had an inspiring physics teacher as a senior. Following his undergraduate studies at WSU, he plans to earn a Ph.D. in chemical engineering and build a career developing technologies to limit the effects of climate change. “Chemical engineering breaks down complex processes into simpler bits. Through research, we can observe and measure how the atmosphere reacts when particles are released into it, and further our understanding of how to develop solutions that limit the warming of the atmosphere,” said Gubsch. His decision to attend WSU evolved quickly, he said, and he’s never looked back. He puts high value on “the experience of WSU” because he’s been able to create a balance in his life. Heading into his junior year, Gubsch plans to facilitate an introductory course for incoming Honors College students and work in Lin’s carbon conversion and chemical engineering research lab. 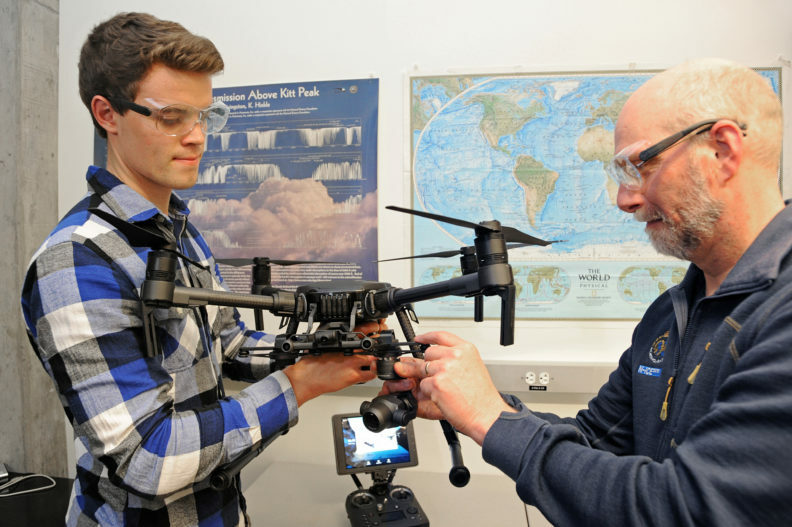 During previous summer research at WSU, he completed a National Science Foundation-funded Research Experience for Undergraduates by working with Laboratory for Atmospheric Research (LAR) Professor Von Walden. Their project focused on building air-quality sensors to help Spokane, Wash., become a more sustainable “smart” city, part of the broader Urbanova project. The overall goal of the project, said Gubsch, is to develop a high-density, low-cost network of sensors in the city that will inform citizens of the air quality in the area; this will be, for example, especially important during wildfire season. Urbanova is a 770-acre-zone living laboratory in the city’s university district in which several programs collect data to gain insights and solve urban challenges. With a colleague, he built six air-quality sensor units to collect particulate matter as small as 1 micron in diameter, monitor carbon dioxide concentration levels, and record temperature, pressure, and humidity. The units called for Raspberry Pi single-board mini-computers, and Gubsch learned to program them using the Python programming language. The data from the team’s sensors will be remotely transmitted to a cloud database in real time. In the future sensors could be attached to light poles, drones, and buses, for example. Measurement results could be shared with the public, empowering people to call for community change through policy and improved technology. Gubsch described his work at a recent poster session, WSU’s Showcase for Undergraduate Research and Creative Activities (SURCA), hosted by the Office of Undergraduate Research, part of WSU Undergraduate Education. LAR is in the Voiland College of Engineering and Architecture’s Dept. of Civil and Environmental Engineering. When asked about critical issues the world is facing, Gubsch applies science to his logic. “People have the misconception that weather equals climate, and that climate change isn’t an urgent issue. But the polar icecaps are warming every year, there’s global warming at the north and south poles, and the concentration of greenhouse gases in the atmosphere increases annually. He and his brother Evan, 10, learned from their parents, Derek and Deborah Reece, that “it’s important to take responsibility and do the little things that add up.” Deborah attended WSU Tri-Cities for her master’s degree in literacy education and teaches ESL in the Fife School District near Tacoma; Derek is an equipment manager at Walsh Construction in Seattle. Gubsch’s WSU experience with investigating and doing research has reinforced his parents’ advice “by helping me be more realistic” about big ideas. Both will help him be an impactful researcher and environmental scientist. NOAA’s Hollings Scholarships—a 10-year-old program—went to 150 undergraduate scholars for 2018; there were nearly 600 applications from 100 colleges in 35 states. Hollings Scholars—all about to enter their junior year in college—study biology, climatology, marine science, biochemistry, cell biology, environmental science, meteorology, and atmospheric science. Seehafer recognized that Gubsch’s interests and academic pursuits align well with NOAA’s goals. She said, “It’s my job to help applicants understand the characteristics that each award’s selection committee looks for in a successful candidate. Throughout the application process, which began last October, Kristian persevered through months of self-reflection and multiple drafts of required essays. It was a pleasure to help him in these efforts. Visit https://DistinguishedScholarships.wsu.edu for more information.